Winter Vegetable Soup - E. Armata Inc. Looking for a way to warm up during the winter months? 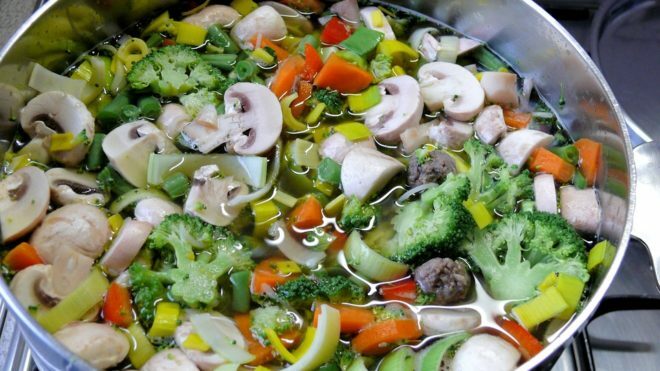 Try this Winter Vegetable Soup as your next meal. Filled with all of your favorite veggies to help fill you up! First, you’ll want to heat up the oil in a dutch oven on medium or high heat. From there you’ll throw in the pancetta, onion, and garlic. Let them saute for about 3 minutes. Next stir in the squash, red potato, celery, carrots, basil, cinnamon, and thyme. Let 4 minutes pass for those to cook. After cooking the following ingredients you’ll add the chicken broth to bring it to a boil. Let it simmer for about 8 minutes. After, add in the kale and let it simmer for about 5 minutes. Lastly, you’ll add in the beans and let them simmer for 4 minutes or until you feel the potatoes and kale have become tender.